LONDON, England (CNN) -- The BBC is refusing to broadcast a plea from leading British charities for aid to Gaza, saying the ad would compromise the public broadcaster's appearance of impartiality. 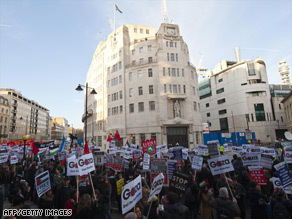 Demonstrators protest at the BBC's central London offices Saturday against the broadcaster's decision. The decision prompted weekend protests in England and Scotland, with one group saying Sunday that 100 people had occupied the foyer of the BBC building in Glasgow, Scotland and would not leave until the BBC runs the ad. The Disasters Emergency Committee, which includes the British Red Cross, Oxfam, Save the Children and 10 other charities, plans to launch the ad on Monday. British broadcasters, led by the BBC, originally declined to air the appeal -- but in the face of criticism from government ministers and others, ITV, Channel 4 and Channel 5 changed their minds. CNN was not approached to broadcast the ad, a DEC spokesman said. In Glasgow, the London-based Stop the War Coalition said Sunday its supporters had moved into the foyer of the BBC building in what the group described as a peaceful protest. The group did not plan to move beyond the foyer but intended to stay there until the BBC changes its decision, said Keith Boyd, a coalition member who called CNN on Sunday. "Primarily we are asking that the ad be shown," Boyd said. The BBC press office would not confirm whether its Glasgow office was being occupied or if protesters were even there. "We don't comment on individual demonstrations," a statement from the BBC press office said. The BBC is standing by its decision to not air the ad, director general Mark Thompson wrote in a blog post on the corporation's Web site. "We concluded that we could not broadcast a free-standing appeal, no matter how carefully constructed, without running the risk of reducing public confidence in the BBC's impartiality in its wider coverage of the story," he wrote Saturday. "Inevitably an appeal would use pictures which are the same or similar to those we would be using in our news programs but would do so with the objective of encouraging public donations. The danger for the BBC is that this could be interpreted as taking a political stance on an ongoing story," Thompson said. "Gaza remains a major ongoing news story, in which humanitarian issues -- the suffering and distress of civilians and combatants on both sides of the conflict, the debate about who is responsible for causing it and what should be done about it -- are both at the heart of the story and contentious," he added. The DEC is "disappointed that the BBC declined to support the Gaza appeal," the spokesman told CNN. "It might limit the reach of our key message to the general public." "That is a decision they must make. We have no view on that subject," he said. Many readers of Thompson's blog post did have a view, however. The statement got hundreds of comments, most of them critical of the BBC. A commenter who signed in as "bully--baiter" said the BBC was taking a side, no matter what it did. "Sorry Mr. Thompson but you cannot have it both ways. If deciding to accede to the DEC request would be seen as political then deciding not to accede to it is also political. Don't insult me with your disingenuous attempts to suggest it is otherwise," the commenter wrote. Other commenters simply rejected Thompson's position out of hand. "I think the reasons for blocking help for a grave humanitarian disaster are simply astounding," "brit--proud" wrote. "How can simply bringing food, medicines and homes to hundreds of thousands of innocent civilians be seen as political impartiality? How stupid do the BBC think the British public are?" "The last thing I want to do, is fund the BBC to broadcast propaganda," "SternG" wrote: "There's no way I will pay the BBC to air the DEC's politically-motivated 'appeal' for Gaza. Gaza is run by a government which is internationally recognized as a terrorist group, including by the EU. There is no doubt that some aid/fund will be 'procured' by Hamas. ... Good decision BBC." British broadcasters have refused to air some previous DEC appeals, the umbrella organization's spokesman said. A planned 2006 appeal for aid to victims of the war in Lebanon was scrapped because "there were genuine concerns, shared by the aid agencies, about the deliverability of aid."